This year marks the centennial of the opening of the Panama Canal, and celebrations are taking place throughout the year. The first boat to make the ocean-to-ocean transit of the canal was the SS Ancon on Aug. 15, 1914. 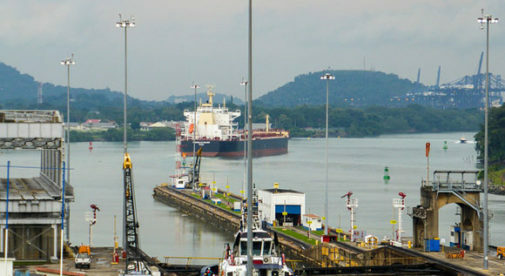 Most visitors who come to Panama make a point of seeing the canal, usually at the Miraflores Locks just outside of Panama City, or the Gatun Locks, just west of Colon city. Personally, I can think of no better way to honor and enjoy this wonder of the modern world than to see it at eye level and take a boat trip on the Panama Canal. The complete transit takes about nine hours, passing through three sets of locks. There are a number of ways to do this, and no matter which one you choose it will be a memorable experience. One of the easiest ways is to take a half-day or full-day trip aboard a ferry with a tour company. These typically start out from the Amador Causeway in Panama City and head north through the canal. At Gamboa, roughly the half-way point, half-day passengers disembark and return to Panama City by bus. The full-day tour goes on to Colon at the Caribbean end of the canal, then provides land transport back to Panama City for its passengers. See these tour guides for more: www.pmatours.net, www.panamacanaltrips.com or www.barefootpanama.com. All of the major cruise ship lines have passages to or through Panama, with ports in Colon and Amador. For travelers in transit one of the major attractions in Colon is the enormous duty-free zone, the second-largest in the world after Hong Kong. For those who love to shop and prefer to travel in luxury, this is the way to go! In honor of the centennial, one tour company now offers a week-long exploration of the Panama Canal Basin, on land and water. The package includes various excursions to a native Indian village, historic colonial forts, a popular national park and unspoiled rainforest as well as a tour of Panama City’s top attractions. A full transit of the canal aboard a large passenger ferry highlights the trip. See here for more information. I was fortunate to be invited by a friend to transit the canal aboard his 47-foot catamaran sailboat and jumped at the chance. As a former cruising sailor, to me this is the perfect way to see the canal. We started from Colon and passed through the Gatun Locks (there are three sets) at night. It was amazing to see the whole operation lit up like a colorful Christmas tree. We anchored for the night just inside Lake Gatun, and after a swim in the cool fresh water of the lake, we slept peacefully under the stars. The next morning we continued on and by late afternoon we were anchored in the bay just off Panama City. No matter which type of vessel you choose to make the trip, you’ll see some interesting and awe-inspiring sites. In the lake, the largest and only inhabited island is Barro Colorado, and it is the home of the Smithsonian Tropical Research Institute. You can visit the research center and learn about all the tropical flora and fauna in this part of the world. On the southern side of Lake Gatun sits the busy hub of Gamboa, with tour boats, private vessels, and Canal Authority launches moving among the large ships and dredging barges. A short ride ashore takes you to Gamboa Rainforest Resort, an oasis in the jungle with bird watching, jungle tram tour, spa and more. The Amador Causeway is just one of the many highlights that you’ll see on your boat trip. The next points of interest are the Gaillard Cut (also known as the Culebra Cut), the most difficult stretch of the canal to dig, blasting through solid rock, followed by passage under the impressive Centennial Bridge. Then you reach the single lock at Pedro Miguel. Once the gates of the lock close and the water starts to enter or exit (going up or down), you begin to realize what an engineering marvel this really is. The water flows into and out of the locks by gravity and pressure—it is not pumped. You can see the force of the water moving and the speed with which it flows. In a matter of minutes the water level is where it needs to be and the gates of the lock slowly open. It is an awe-inspiring sight. As you approach the Pacific Ocean the Balboa Port and Shipyard looms ahead, with acres of containers stacked up like Legos, waiting to be shipped around the world. The next landmark is the Bridge of the Americas that carries the Pan American Highway over the canal. Until the construction of the Centennial Bridge in 2004 this was the only bridge that connected the Americas. Navigating alongside the Amador Causeway you can’t miss the new Biodiversity Museum, an eccentric, colorful structure designed by Frank Gehry. Once you complete the turn around the end of Isla Flamenco the fantastic Panama City skyline appears before you, a striking panorama of spires and skyscrapers mingled with colonial tiled roofs and shopping center billboards. 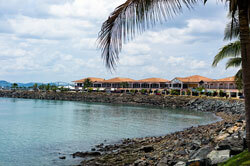 When you come to Panama, a visit to the canal at the Miraflores or Gatun Locks Visitor Center is an absolute must. To truly experience all the wonders of this engineering marvel, hop aboard a boat and get underway through this transoceanic route.